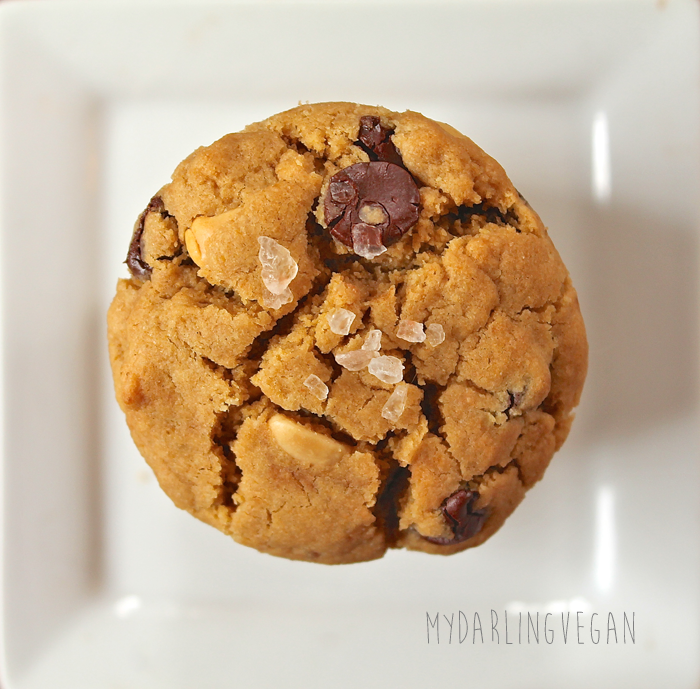 Never in my life did I think I would make a gluten free, vegan cookie. I'm of the opinion that living a life of balance is ideal. But then my partner went on an elimination diet for health reasons. He removed: dairy, eggs, sulphites, glutenous grains, and basically all fun. So in an effort to satisfy his sweet cravings, I attempted this recipe, which I tweaked and adapted from 'mydarlingvegan.com'. And the results were pretttttty delicious. These cookies are really chewy, moist and delicious. I've pimped it up a bit, using large crystals of Sicilian salt, gently crumbled and sprinkled on top. I also used a couple scoops of my homemade pumpkin seed butter to max out on nutrients. Cashews were also added and Mexican chocolate chips from ChocoSol. Disclaimer: this recipe is by no means healthy just because I substituted eggs, milk and wheat. They contain their own nutritional benefits. This recipe is for those who have intolerances and allergies, of which I have a new found respect for. Preheat the oven to 350F. Line to baking sheets with parchment paper and set aside. In a small bowl combine the quinoa flour, baking soda, baking powder, and salt. In a separate bowl, whisk together the coconut oil, sugar, and flax egg. Add the peanut butter and vanilla extract and stir to combine. Gently fold the dry ingredients into the wet. Once fully incorporated stir in the chocolate chips and peanuts. Scoop cookies onto the baking sheet (about 2 tablespoons per cookie), flatten slightly and sprinkle a little sea salt on each cookie. Bake for about 10 minutes until slightly brown on the edges. They will feel slightly underdone but will continue to harden while they cool. Let cool 5 minutes on the baking sheet then transfer to wire racks to cool completely. To make a chia seed egg combine 1 tablespoon of chia seeds with 3 tablespoons of water. Whisk together until thick and gelatinous. If you have a coffee grinder, blitz the seeds a little before adding water.